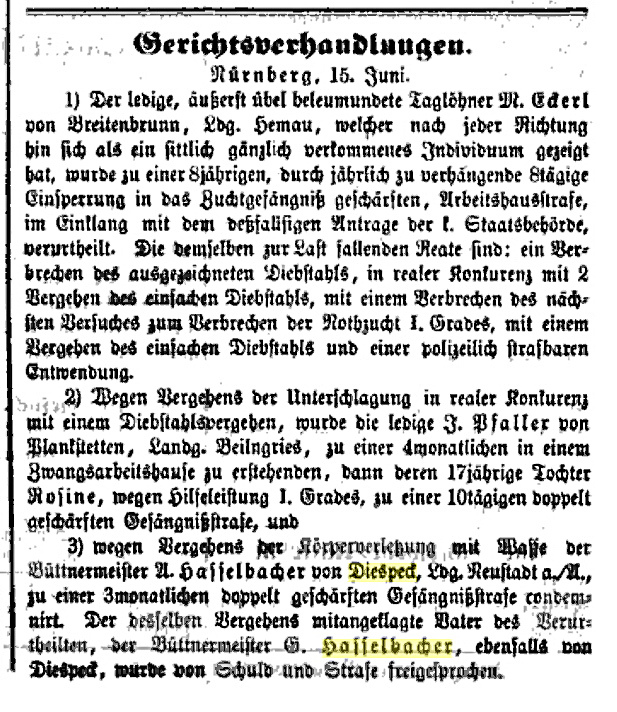 In the same Google Book search in which I found notice of Johann Peter Hasselbacher's emigration to America (indeed the same year), I found this notice concerning a relative from Diespeck. I struggled to translate it. The combination of the relatively poor image quality, the Fractur typeface, the old style German spelling, and unfamiliar words got the best of me. I thought I was dealing with some business or occupational notice. I asked for some help from my German cousin Dieter who came to my rescue. The notice was of something entirely different that I suspected. Here is the notice (#3 in the image below), together with the German transcription and translation by Dieter. 3) wegen Vergehens der Körperverletzung mit Waffe der Büttnermeister Andreas Hasselbacher von Diespeck, Lbg. Neustadt a./A., zu einer 3monatlichen doppelt geschärften Gefängnißstrafe condemnirt. Der desselben Vergehens mitangeklagte Vater des Verurtheilten, der Büttnermeister Georg Hasselbacher, ebenfalls von Diespeck, wurde von Schuld und Strafe freigesprochen. 3) for violation of assault with weapon Büttnermeister (Master Barrel-maker) Andreas Hasselbacher of Diespeck ... Neustadt a / A. condemned to a 3-month double-sharpened imprisonment. The same offense, the convicted co-defendant's father, the Büttnermeister Georg Hasselbacher, also from Diespeck, was acquitted of guilt and punishment. The phrase, "Doppelt geschärfte Gefängnisstrafe" translates as "Double sharpened prison." Dieter researched this for me. It implies that the offender should be prepared for anything. "That means lie on bare boards and withdrawal of all hot food every third day- and over many months. Reports of such judgments 'in the name of the king' can be found in the papers of the 19th Century often." Andreas' father Georg was my 5G Uncle, and Andreas my 1st cousin 5 times removed. I have no idea how, when, or where Andreas got in trouble. 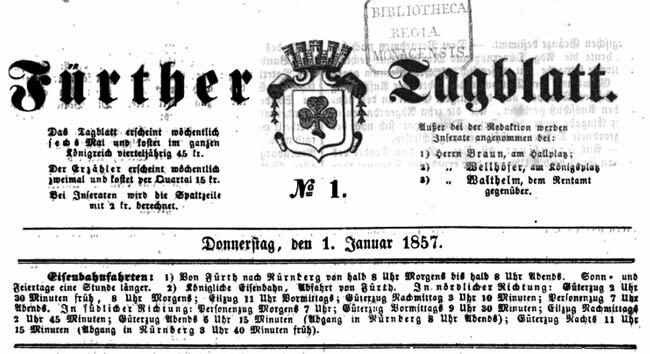 The fact that the announcement was in a newspaper from Fürth (near Nürnberg) makes me wonder where he was living or working at the time. The date of the notice is 15 June 1857. Some other dates are informative. Andreas married Katharina Popp 1 year earlier on 3 June 1856. I have an abstract record of their marriage in Diespeck where the couple had their second child on 7 Feb 1857. Katharina was from Adelsdorf, 4 km. south of Markt Erlbach. Andreas and Katharina had their first child there as an unmarried couple in June 1852. I know from American census records that Katharina had lost a child. This child was named Freidrich presumably after his godfather and uncle Friederich Popp, but perhaps also for his father. I do not have a death record for little Friederich, but it may have been recorded as Freiderich Popp. Andreas was 27 at the time of his offense. He and Katharina had 5 additional children in Diespeck. The last was Kunigunda, born in 1870. In 1872, at the age of 42, Andreas and his family emigrate to Cincinnati, Ohio. In America, Andreas continues to work as a barrel-maker. Several of his children married and had families themselves, but I have not yet been able to find a single living relative. The family of Georg must have been interesting indeed. Georg himself seems to have come close to indictment in the affair above. At least two and probably three of his children come to America. There is no evidence that any of his 7 daughters who survived childhood were married in Diespeck, but nearly all had illegitimate children. One of these, Margareta Barbara, comes to America with her son Johann Konrad in 1855. Another, Maria Barbara had 9 children, but the Diespeck church records suggest that only only one survived their first year. I do not know why Andreas and his family left Germany. His father died in 1866 and presumably Andreas had the chance to be a principal barrel-maker in the village. He probably emigrated for the usual reasons of economic opportunity and independence. He had a sister come over first who might have told him what to expect. However, it is tempting to speculate that the family might have had other reasons not to be comfortable in Diespeck. Cousin Dieter is a descendant of Balthasar Hasselbacher of Münchsteinach. I have enjoyed getting to know him. He is an interesting person for several reasons, but most remarkably from the perspective of this website, he is the rare individual who became interested in genealogy and family history at a young age. I think he was photographing old church books and learning to read the old script when he was still in his 30s. I did not start until I was nearly 60. To my eyes, Dieter is still a young man. I am hopeful he will continue his interests for all our benefit. This is not the first example of violent crime I have encountered in my family. A living cousin in Nürnberg related that they heard a story of one of our fore-bearers being robbed and killed. I thought I had identified that individual when I found a newspaper report in the old library in Augsburg. A police report and obituary told that my paternal grandmother's Uncle Joseph Baÿerl was murdered in a bar fight there. An older cousin disabused me of that assumption when he remembered that it was my Grandmother's Grandfather Joseph Baÿerl, a livestock dealer, who was murdered in Dinkelsbühl. It would appear that both father and son Joseph were killed. This would explain why I suddenly lost track of what happened to my GG Grandfather Joseph Baÿerl, and why his family moved suddenly from Dinkelsbühl to Augsburg. I will write more about these events elsewhere. Peter Hasselbacher, 25 Dec 2010. Contact me.